Well boooo to everyone wanting a piece of you. Don’t they know you aren’t Britney Spears? You didn’t go crazy and shave your head, did you? 😉 I certainly hope your week gets better, Rachelle! TGIT!! This pot roast looks killer, girlfriend! I just picked up some short ribs yesterday, so I’m not sure if you are a mind reader or stalking me, but either way, thanks for posting this! Serving ’em over mashed taters sounds pretty dang stellar. Cozy, comforting nom noms at its best! Cheers doll! And P.S. LOVE that you said ‘help me rhonda’!! P.s.s Boys favorite beer is our local southern pines brew. Must tell him about and check out yours!! LOL! Last I checked I still had all my hair and I successfully survived and made it to the weekend! I never told you about my super power? I can totally read minds which makes stalking unnecessary! Sweet Josie Brown is one of my favorite brown ale’s. I also love the Lazy Bird from Birdsong Brewing here in Charlotte. Cheers, girlfriend! I’m with you on this is a tough week! Makes me long for the Christmas break again! We can survive….and just keep plowing through. 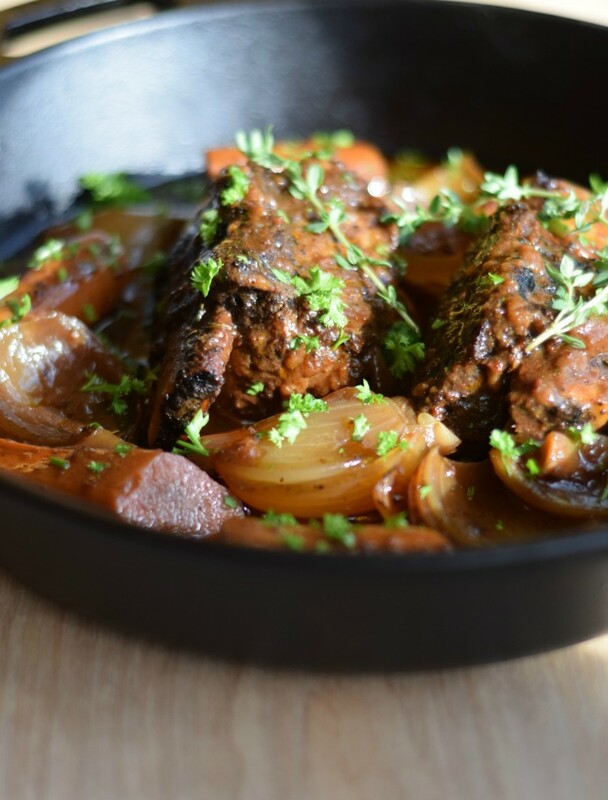 These short ribs sound soooo delicious! Comfort food and a perfect dinner. Hang in there! If only we could go back to vacations! Thanks Kathy! You hang in there too! OMG Rachelle! 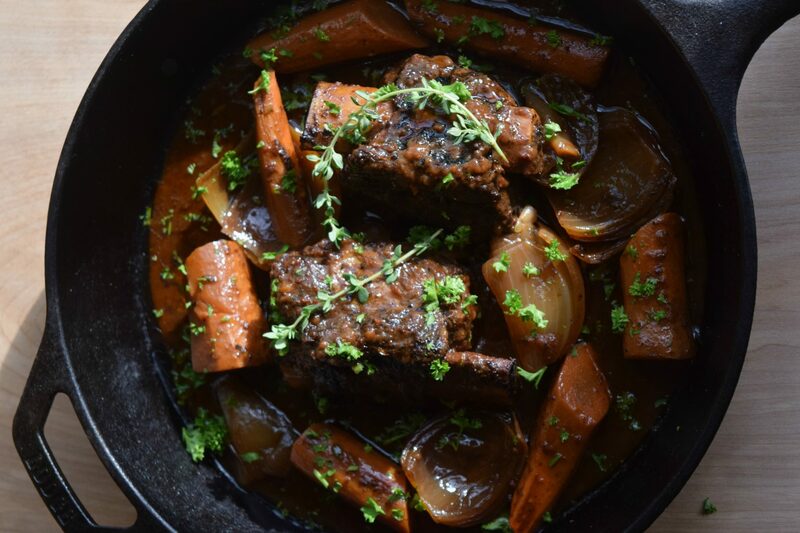 These short ribs sound unbelievable! My husband Tom loves short ribs, so these will be added to my “must try” list for sure!! So warm and comforting for the chilly weather ahead! Thanks Mary Ann! They sure are perfect for this cold weather! I’ve never heard of that brown ale before, but it sounds good! 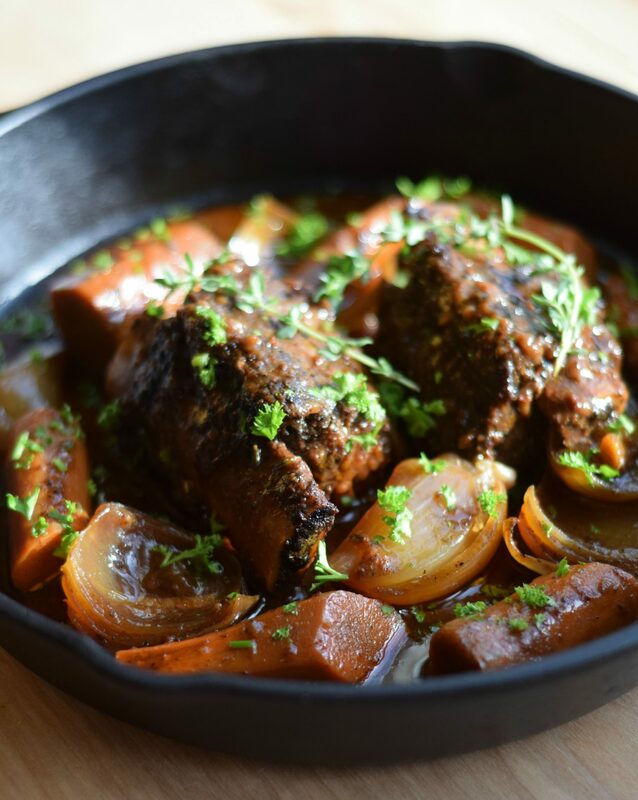 I love how you paired it with this dish, Rachelle! This looks like comfort food at its finest and I totally wish I had this for dinner today! It’s an NC brewery, Gayle, so they may not have it up there where you are yet. If you can get some, I highly recommend it! Thanks! Sorry you’ve had a rough week. I know exactly what you mean about everyone wanting a piece of you. Sometimes there just isn’t any more to give! But can you give me some of this? It looks amazing. I love cooking beer into my meat! LOL! I’ve got the driveway and extension cord ready for you and your pimped out camper, Karrie! I hope your week improves, Rachelle! I’m sure these short ribs helped just a little? I know they would cheer me up! I looooove short ribs so very much! I totally love that you said “Help Me Rhonda” – I’m singing the song now and probably will for the rest of the day 🙂 Love me some Beach Boys! Aaw hope your week gets better. 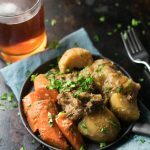 This pot roast looks like the ultimate comforting dish to make any bad day better! Love the brown ale in here! Beer always makes me feel better! Thanks, Kelly! I hope you get some rest this weekend Rachelle! 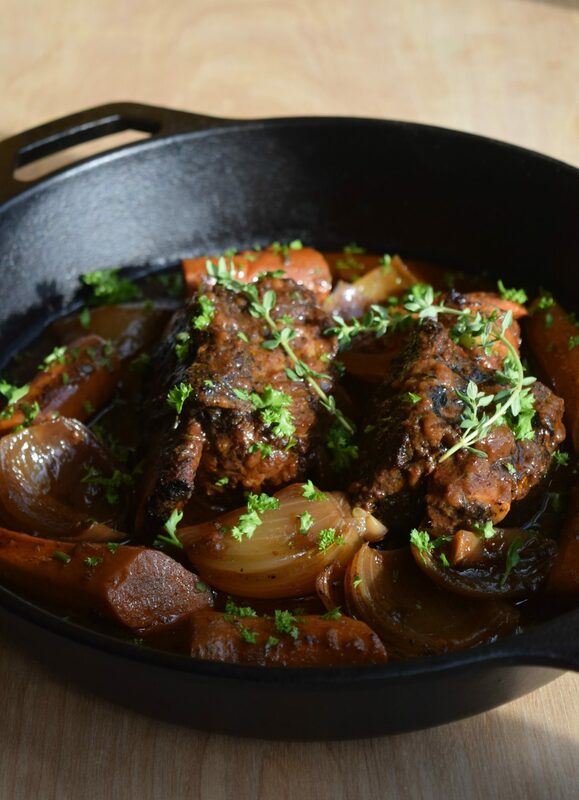 This dish looks perfect for the cold weather around here! Love the use of brown ale! Pinned! I’m totally taking it easy this weekend and hoping next week is better, Mira! Thanks for the Pin! As soon as I saw this roast my mouth started watering. And it’s not even 11 a.m.! What a great meal for the cold weather. I’ve never seen that ale in the liquor store around here. I’ve heard of so many local beers and ales that I’ve wanted to try. Maybe I should join one of those subscription clubs. 🙂 This looks fabulous! Ha! Thanks, Amanda! It’s a craft beer from a local brewery, so it may not be available where you are. 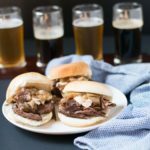 You can substitute your favorite brown ale if you want to make it. My mouth is watering for pot roast! It sounds like the perfect winter meal. 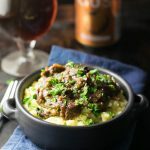 I’ve never braised meat with beer before but I think I need to change that soon. I hope your next week is better! 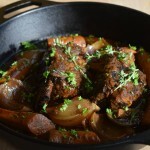 The pot roast is a perfect comfort food, and yours looks so delicious! Thanks so much for your kind words, Melanie! I am having one of those weeks too. There’s just so much to do and no time to catch a breath! love the flavors in this dish! Thank goodness we made it to the weekend, Manali! Thanks! Jeez girl! I know Im vegan and all but, please come cook for me sometime? Your dishes always look out of this world! Wishing you a great next week too Gaila! Thanks! Yum! These short ribs look falling off the bone incredible! The beer is such a great flavoring agent. I hope this coming week is a good one for you. Thanks, girl! So far, so good. Fingers crossed! Hi! 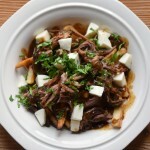 Your braised short ribs looked so yummy that I included the recipe in my latest buzzfeed post! Thanks so much for including me! Shared!